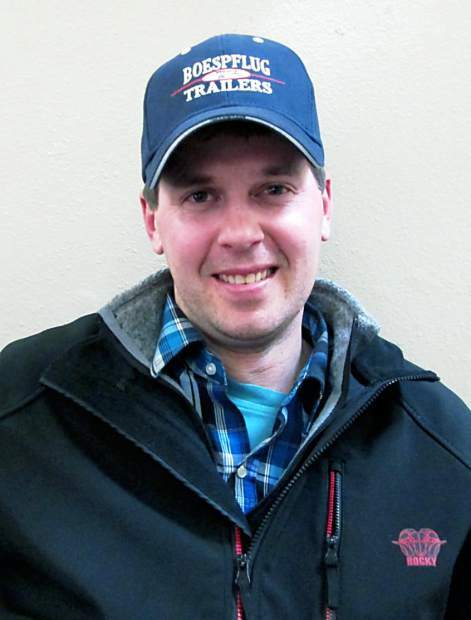 Sam Juntunen, Amidon, North Dakota, bought Lots 27, 67, and 84. Vicki and Jim Wilkinson, Reva, South Dakota, purchased Lot 45 at $8,500. 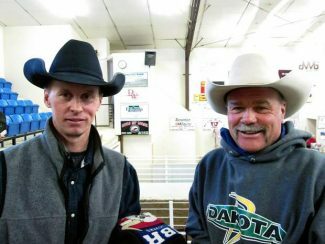 Chad Rotenberger with Ron Floyd, Ludlow, South Dakota, after the sale. 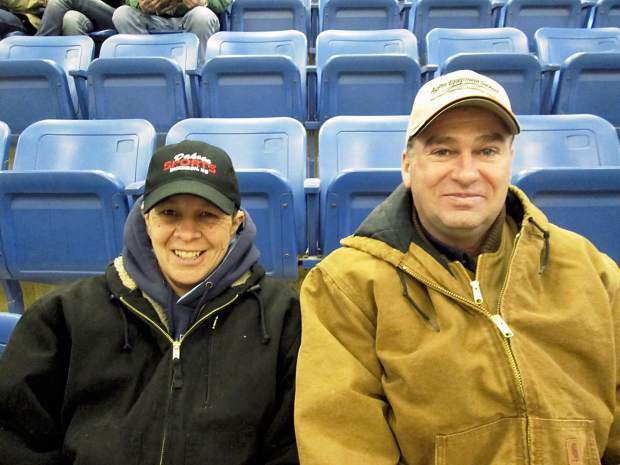 Spruce Hill Ranch, owned by Chad and Michelle Rotenberger, and Bill Rotenberger, hosted a big crowd for their annual bull sale. The Rotenberger family wants happy customers, who remain enthused about their purchases from Spruce Hill Ranch. Chad and Bill produce rugged, range-ready two-year-old bulls that can thrive in any environment. The Spruce Hill Ranch is truly in the heart of some of the best ranch country in America. This is an area where cattle have to prove themselves, as the winters are not for the weak-hearted…and some summers can turn off rather dry. These cattle are bred for this environment, with females that will flesh up and breed back, along with bulls that are full of muscle and still extra sound on their feet and legs. 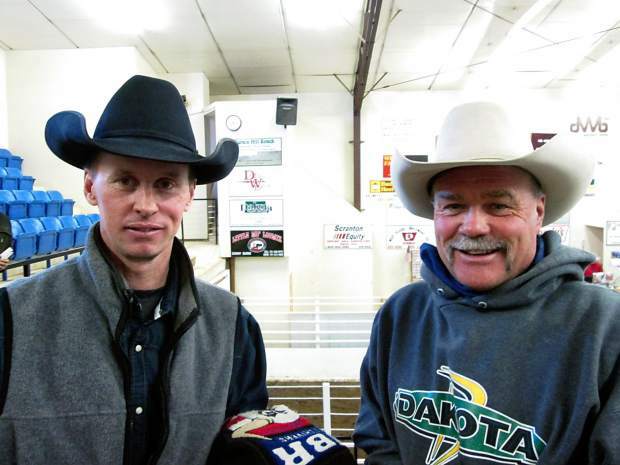 The Rotenbergers brought an outstanding set of big, strong two-year-old bulls to town. These bulls were big and wide-made, with a tremendous amount of volume. The Rotenbergers have identified their top cows, and have used embryo transplants from these cows to offer several groups of brothers of the very best genetics. The sale started out very competitive, and stayed good throughout the sale. I really felt like this was a top set of Angus bulls—and the SimAngus give another excellent option for producers. Top-selling bull of the day was Lot 14, selling for $23,000 to the Gilbert Angus Ranch from Buffalo, South Dakota. This was a good Angus bull!! Spruce Hill War Party 417 was a son of Werner War Party 2417 and out of Spruce Hill Erica 248C 3104. He had an 84 pound birth weight and a weaning weight of 809 pounds. With EPDs of BW 0.9, WW 52, YW 99, and MILK 30, he had a 45.5 cm. scrotal measurement. Lot 83, another Angus bull, also sold to the Gilbert Angus Ranch at $11,000. This son of PA Power Tool 9108 was out of a War Party daughter. He had EPDs of BW 2.3, WW 58, YW 108, MILK 35, and $B 147.73. Born at 85 pounds, he weaned at 749 pounds to ratio 105. He was very deep and correct in his makeup. Alan Knippling, Gann Valley, South Dakota, chose Lot 1 at $10,500. This son of Basin Payweight 107S was out of a daughter of Spruce Hill Ahead of Time 104. He had EPDs of BW 1.4, WW 58, YW 98, MILK 25, and $B 155.73. He entered the world at 86 pounds and reached a weaning weight of 747 pounds. The winning bidder on Lot 36 was Rote Farms, Lisbon, North Dakota, with their final bid of $9000. Sired by Sitz Upward 307R, he was out of a daughter of Stevenson Bruno 561G. He hit the ground at 87 pounds, weaned at 802 pounds, and posted a scrotal measurement of 41.5 cm. His EPDs were BW 3.7, WW 53, YW 94, MILK 32, and $B 170.03. Jim Wilkinson, Reva, South Dakota, bought Lot 45 at $8,500. He was a son of Sitz Upward 307R and out of a Spruce Hill Magnum bred dam. With a 78 pound birth weight, this high performance bull achieved a weaning weight of 799 pounds to ratio 113. His EPDs were BW 1.6, WW 62, YW 111, MILK 32, and $B 167.32. Long-time, repeat buyer, Dan Thompson, Buffalo, South Dakota, selected Lot 2 at $8500. He was a son of Basin Payweight 107S, and a flush brother to Lot 1. The top-selling SimAngus bull was Lot 101 at $7,000 to Horizon Farms from Rhame, North Dakota. He was out of the flush by JF Merit 618S and Spruce Hill 100 Lady 4114. He was homo black, polled, and half Simmental. Allen Stirling, Newell, South Dakota, chose Lot 102 at $5,500. This SimAngus bull had the same genetics as Lot 101.